Heather Knight '06, SM '08, at Ignite LA. Think of it as stand-up for geeks. Ignite, a mesmerizing event series, creates a stage for the technology-minded to present ideas fast—five minutes of microphone time with 20 slides clicking forward every 15 seconds. Naturally, some MIT folks have hit the stage. Heather Knight ’06, SM ’08 of NASA’s Jet Propulsion Lab described how to make robots more social on a YouTube video filmed at Ignite LA on July 21. 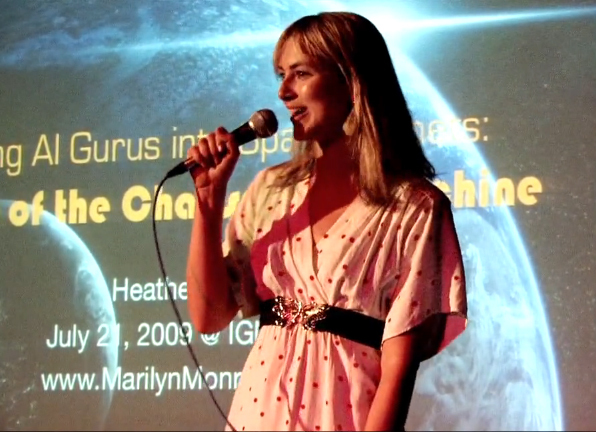 Her talk, “Turning AI Gurus into Comets: The Rise of the Charismatic Machine” describes an interactive installation she and a JPL team created for an artificial intelligence conference: they transformed participants’ cell phone signals into comet visualizations whizzing in space. She acknowledged her friendly robot bias, having worked in MIT’s Personal Robots Group and for the French firm Aldebaran Robotics, the first European humanoid robot manufacturer. Ignite was started by Brady Forrest, technology evangelist for O’Reilly Media, and Bre Pettis of Etsy.com, and inspired by Pecha Kucha Nights, where creatives got six minutes and 20 slides to share ideas. The first Ignite was held in Seattle in 2006 and the events have spread across the across the U.S. and worldwide. Check out the How-To section of the Ignite site to plan your own local geekathon. Our post listing five revolutionary video games spawned from the minds of MIT alumni generated much buzz—and a list of other games and developers that should also be included. So, like the best of all sequels, here is another installment of groundbreaking, inventive, and really cool video games, all with ties to MIT. Larry Demar ’79 codesigned these games. These days, his company, Leading Edge Design (LED), creates gaming concepts for casinos. Was originally conceived as a bootlegged hack of Pac-Man called Crazy Otto and created by Doug Macrae NON ’81 and Kevin Curran NON ’81, founders of then video-game company General Computer Corporation. Eventually Atari hired the pair to make games for them legitimately. Rob Hunter ’73 made the deal and signed the contract between CBS Video Games and John Madden for the original game. He codeveloped the game construct (as far as he knows, the first ¾ over-the-shoulder view of any sports game) with Madden’s active involvement. Philip Tan ’01, SM ’03 wrote in to say that Looking Glass Studios had numerous MIT alums working on its first-person computer role-playing, action role-playing, and stealth video games. Those alums dispersed to various parts of the industry (like Harmonix, Electronic Arts, Mind Control Software, and Irrational Games/2K Boston) when the company closed. Eri Izawa ’92 codesigned this game, a first-generation MMORPG. Trevor Stricker ’97 codeveloped these and is currently working on Quick Hit Football with Denise Ichinco ’09. Students and faculty at MIT’s Education Arcade developed this multiplayer, American Revolution-themed role-playing game. Sande Chen ’92 was nominated for a Writers Guild of America award for outstanding achievement in videogame writing for this, the 2007 PC role-playing game of the year. Rob Jagnow SM ’01, PhD ’05 and his company, Lazy 8 Studios, released this game for the PC in April. It’s an innovative puzzle in which players build a variety of machines from sliding tiles. Jagnow did all the programming and level design. And, of course, we’d be remiss if we didn’t mention the Singapore-MIT GAMBIT Game Lab, a collaboration between the Massachusetts Institute of Technology and the government of Singapore created to explore new directions for the development of games as a medium. This month’s issue of Quick Take offers a sip from the fire hose with a look at fluid—alum innovations in olive oil, fluid trampolines that represent chaos theory, an understanding of traffic flows—you get the picture. And one section, called Drink, offers numerous new stanzas proposed for the Engineers’ Drinking Song as composed by alumni partaking in last year’s Alumni Association puzzle hunt. If you haven’t read them, or need a refresher of the standard lyrics, take a look. And, for your enjoyment, here’s a video of the Chorallaries of MIT (students and alumni) performing the song at a spring 2009 concert. Class of ′04 alums Margaret and Joseph Wong met during pre-frosh weekend in 1999 and started dating through 8.01 and 18.02. Today the couple runs a successful wedding planning Web site called Project Wedding, which collaborates closely with online dating service eHarmony. Margaret recently reflected on her work, MIT’s impact on it, and the effects of the country’s financial turmoil on the wedding industry. Slice: How did you get involved with eHarmony and Project Wedding? MW: Joe and I started Project Wedding when we were planning our own wedding, to help connect brides with each other and share vendor reviews, inspirational photos, and planning tips and advice. About eight months after we started Project Wedding, Joe got an interesting private message from a bride on the site… who turned out to be an eHarmony executive interested in acquiring us. Now we work on Project Wedding on a daily basis at eHarmony headquarters. Slice: How does your MIT education inform your work? MW: Probably the most important thing I learned at MIT was from 6.170 (software lab for the old-school techies), which is KISS, “Keep it Simple, Stupid.” When designing Project Wedding, I keep KISS in mind and focus on what our audience really craves, and filter out all the noise. I should also add that without my MIT education, I would never have met Joe during pre-frosh weekend. It was through 8.01 and 18.02 that Joe and I started dating. Who knew that nerd love would lead us to eventually get married, which prompted us to start our own company in the wedding and publishing business. Slice: Has the economic volatility of the last year or so affected activity on eHarmony and PW? MW: The average wedding budget has decreased dramatically over the past year because of layoffs and economic hardship. As a result, we’re seeing a huge surge of traffic of Project Wedding (over 500,000 brides visit every month) because people are searching online for the best vendor deals using our vendor reviews, creative do it yourself projects, and advice from other brides on how to plan a dream wedding on a budget. For example, one of Project Wedding’s brides got married in Southern California for less than $5,000, which is amazing! eHarmony’s singles matching service has also seen an increase in registrations. Many people are taking the time to re-evaluate their lives and find that they want to find someone to share their life with. Research shows that stress, including financial pressure, can orient singles to want a strong, close relationship more. Slice: What do you love most about your work? I love that I get to think up new and beautiful ways to help people plan the beginning of their new life together. I read and look at the most beautiful images and love stories everyday. I get to work with my husband everyday. We’re with each other 24/7 and I really enjoy working with him, much to the surprise of some people. 😉 It’s a pretty awesome job. The Bokode, center, contains far more information than conventional barcodes. Barcodes are ubiquitous, producing little pops of information at checkout counters worldwide. 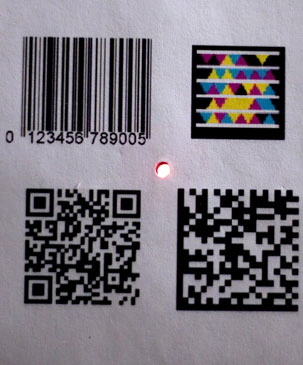 The Media Lab has come up with a new, tinier barcode that could provide information useful to shoppers as they scan the shelves and could lead to new types of presentation devices, video games, or motion-capture systems. The new system, called Bokode, is based on a different way of encoding visual information, says Media Lab Associate Professor Ramesh Raskar, who leads the lab’s Camera Culture group. The new approach encodes data in the angular dimension: Rays of light coming from the new tags vary in brightness depending on the angle at which they emerge. The name Bokode comes from the Japanese photography term bokeh, which refers to the round blob produced in an out-of-focus image of a light source. The Bokode system uses an out-of-focus camera—which allows the angle-encoded information to emerge from the resulting blurred spot— to record the encoded information from the tiny tag. Bokodes have several advantages. They can be read from several meters away by a cell phone camera; they can provide much more information, such as a complete nutritional description; and you can scan several nearby items to compare them. Gregory Liszt PhD '06, left, with Crooked Still. A bluegrass band that began life practicing in MIT’s biology building? Now that’s worth a listen on NPR’s On Point—especially how that MIT connection came to be. The connection is Gregory Liszt PhD ’06, who earned his PhD in biology while he plied his banjo with the other early members of Crooked Still. The band, founded in 2001, now plays major festivals and club gigs in the U.S. and abroad. Crooked Still consciously weaves together genres such as improvised old time music, bluegrass, folk, and their own string band songs. The Boston Globe called it “the most important folk group to emerge from Boston since the early 60’s.” They have been praised for their highly creative arrangements, funky rhythms, and brilliant musicianship. Get some background on Liszt’s own musical style in an interview conducted shortly after he had toured with the Bruce Springsteen Seeger Sessions band, an 18-piece group celebrating and modernizing Pete Seeger’s collection of original music. Check the Crooked Still web site for upcoming gigs and how to find their music, including a new album, Crooked Still Live!